I hope you enjoyed the excerpt and fingers crossed that it wins! I would be over the moon if that happened. 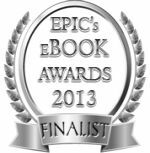 This entry was posted in awards, Heart of Darkness, paranormal romance, vampire romance. Bookmark the permalink. Felicity, well done you….. It’s a fab book. Hope you win with it!!!! I am out of the office from 8th November until 3rd December 2012, but will respond to your email as soon as I return. Â I won’t know until March 2013, I think. They announce them at the convention. Fingers crossed!